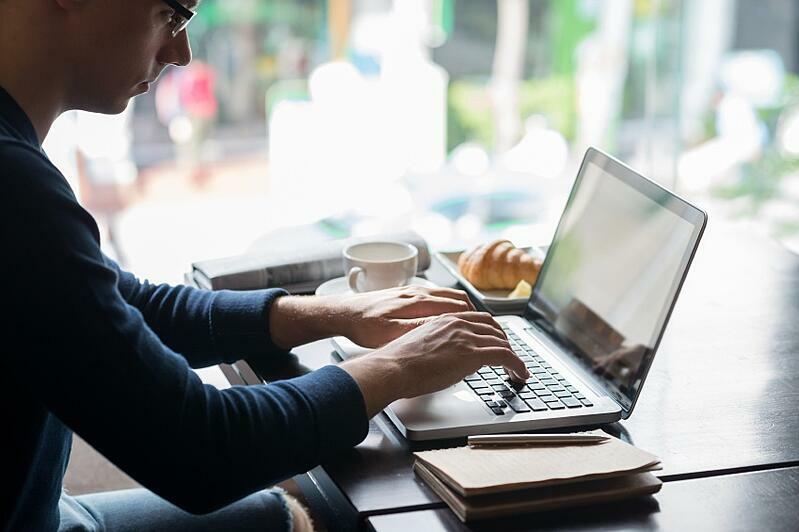 Writing the actual blog title can sometimes feel like a whole other project on top of the topic and keyword research and content writing you’ve already done. But it doesn’t have to be! That’s because there are headline formulas you can use to ensure that they’re more likely to be clicked than ignored. Garrett Moon is the founder of CoSchedule, a SaaS marketing calendar tool that uses a drag-and-drop feature to allow for easy scheduling of marketing, blog and social content all in one place. That means that Garrett and his team have access to a lot of data on blog titles, including what gets shared, what doesn’t, and where those shares happen. 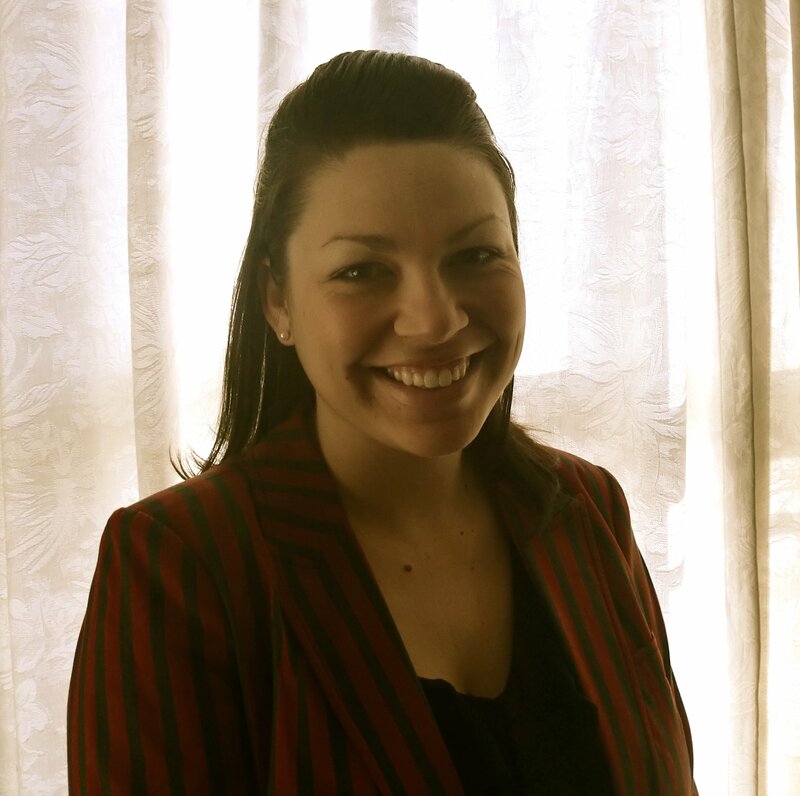 In a guest post for OkDork, Moon outlined how they went about analyzing the data of nearly one million headlines. To make the analysis more manageable, he narrowed down his dataset to published, English-only posts using 100 total shares as a baseline. Here are some of his biggest findings. 1. 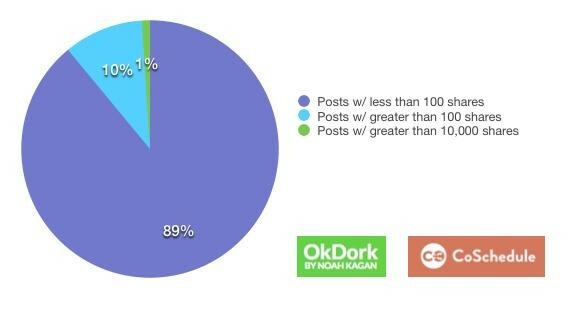 Only 11% of posts get more than 100 shares. At xoombi, we did an analysis of our own content and found that only 67 of our 260 published posts have 100 or more shares. That means that 26%, or a quarter, of our posts have over 100 shares. Although the xoombi blog is doing better than the average, there’s still room for improvement. 2. 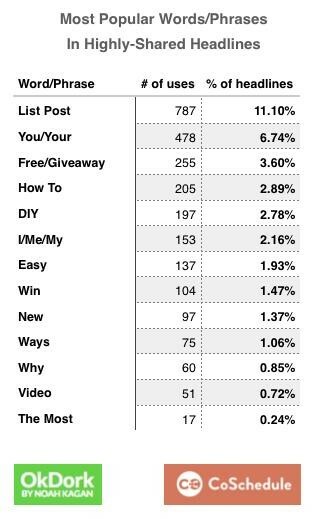 Lists posts, titles that use “you”, and how to posts perform best. Despite not using the terms “free” or “giveaway” on our blog, it’s pretty crazy how closely aligned our most popular post titles are with those found in CoSchedule’s study. Now that you know what types of posts perform best and what words you should include in your blog titles to increase the likelihood your content is shared, how can you test the overall power of your headline? 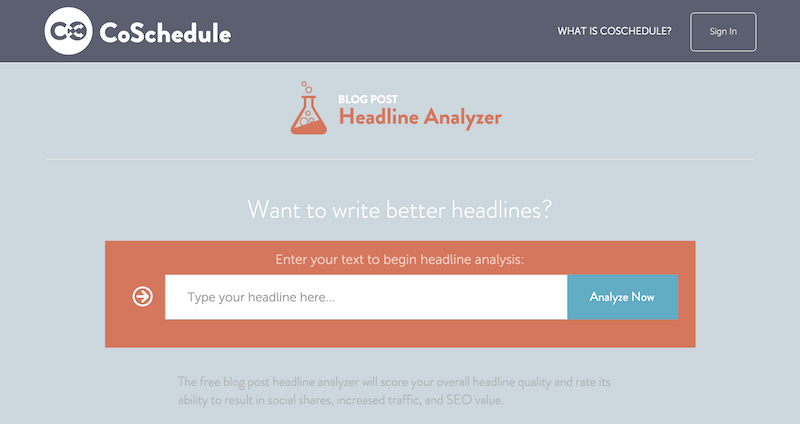 Enter free headline analyzer tools. 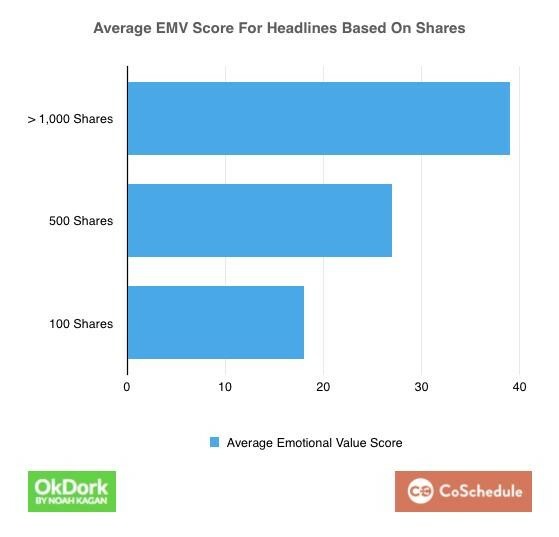 One of the original tools is the Advanced Marketing Institute’s Emotional Marketing Value Headline Analyzer, which analyzes the number of emotional words used. I’m pretty sure that because of the research Moon and his team conducted, CoSchedule created their own Headline Analyzer. Ultimately, I prefer CoSchedule’s free tool and highly recommend it. Last but not least, it’s important that, for SEO purposes, you optimize your headlines for both readers and search engines. I usually go with the more emotional headline (the better headline) and put the ‘SEO’ headline in the meta title tag. Another option is to use the SEO headline for the post itself and then use the more emotional headline for social sharing/promotion. There you have it! Now that you know how to write the ultimate blog title, it’s time to put your writing chops to the test. And don’t forget, after you’ve published your posts, make sure to go back and see how they’ve performed based on headline type; the results will most likely confirm Garrett’s and our own findings!